pictures are not in their origianl location. Certain interpretations of quantum mechanics, the revolutionary theory developed early in the century to account for the anomalous behavior of light and atoms, are being misconstrued so as to imply that only thoughts are real and that the physical universe is the product of a cosmic mind to which the human mind is linked throughout space and time. This interpretation has provided an ostensibly scientific basis for various mind-over-matter claims, from ESP to alternative medicine. "Quantum mysticism" also forms part of the intellectual backdrop for the postmodern assertion that science has no claim on objective reality. The word "quantum" appears frequently in New Age and modern mystical literature. For example, physician Deepak Chopra (1989) has successfully promoted a notion he calls quantum healing, which suggests we can cure all our ills by the application of sufficient mental power. Quantum mechanics is thought, even by many physicists, to be suffused with mysteries and paradoxes. Mystics seize upon these to support their views. The source of most of these claims can be traced to the so-called wave-particle duality of quantum physics: Physical objects, at the quantum level, seem to possess both local, reductionist particle and nonlocal, holistic wave properties that become manifest depending on whether the position or wavelength of the object is measured. Despite wave-particle duality, the particle picture is maintained in most quantum mechanical applications. Atoms, nuclei, electrons, and quarks are all regarded as particles at some level. At the same time, classical "waves" such as those of light and sound are replaced by localized photons and phonons, respectively, when quantum effects must be considered. In conventional quantum mechanics, the wave properties of particles are formally represented by a mathematical quantity called the wave function, used to compute the probability that the particle will be found at a particular position. When a measurement is made, and its position is then known with greater accuracy, the wave function is said to "collapse," as illustrated in Figure 1. Figure 1. Wave function collapse in conventional quantum mechanics. An electron is localized by passing through an aperture. The probability that it will then be found at the particular position is determined by the wave function illustrated to the right of the aperture. When the electron is then detected at A, the wave function instantaneously collapses so that it is zero at B.
Einstein never liked the notion of wave function collapse, calling it a "spooky action at a distance." In Figure 1, a signal would appear to propagate with infinite speed from A to B to tell the wave function to collapse to zero at B once the particle has been detected at A. Indeed, this signal must propagate at infinite speed throughout the universe since, prior to detection, the electron could in principle have been detected anywhere. This surely violates Einstein's assertion that no signals can move faster than the speed of light. Although they are usually not so explicit, quantum mystics seem to interpret the wave function as some kind of vibration of a holistic ether that pervades the universe, as "real" as the vibration in air we call a sound wave. Wave function collapse, in their view, happens instantaneously throughout the universe by a willful act of cosmic consciousness. Thus they follow Capra in imagining that quantum mechanics unites mind with the universe. But our inner sense of "profound unity with the cosmos" is hardly scientific evidence. The conventional interpretation of quantum mechanics, promulgated by Bohr and still held by most physicists, says nothing about consciousness. It concerns only what can be measured and what predictions can be made about the statistical distributions of ensembles of future measurements. As noted, the wave function is simply a mathematical object used to calculate probabilities. Mathematical constructs can be as magical as any other figment of the human imagination-like the Starship Enterprise or a Roadrunner cartoon. Nowhere does quantum mechanics imply that real matter or signals travel faster than light. In fact, superluminal signal propagation has been proven to be impossible in any theory consistent with conventional relativity and quantum mechanics (Eberhard and Ross 1989). Not everyone has been happy with the conventional interpretation of quantum mechanics, which offers no real explanation for wave function collapse. The desire for consensus on an ontological interpretation of quantum mechanics has led to hundreds of proposals over the years, none gaining even a simple majority of support among physicists or philosophers. Nevertheless, quantum mystics have greeted the possibility of nonlocal, holistic, hidden variables with the same enthusiasm they show for the conscious wave function. Likewise, they have embraced a third view: the many worlds interpretation of Hugh Everett (Everett 1957). Everett usefully showed how it was formally possible to eliminate wave function collapse in a quantum theory of measurement. Everett proposed that all possible paths continue to exist in parallel universes which split off every time a measurement is made. This has left the door open for the quantum mystics to claim that the human mind acts as sort of a "channel selector" for the path that is followed in an individual universe while existing itself in all universes (Squires 1990). Needless to say, the idea of parallel universes has attracted its own circle of enthusiastic proponents, in all universes presumably. Admittedly, the quantum world is different from the world of everyday experience that obeys the rules of classical Newtonian mechanics. Something beyond normal common sense and classical physics is necessary to describe the fundamental processes inside atoms and nuclei. In particular, an explanation must be given for the apparent nonlocality, the instantaneous "quantum leap," that typifies the non-commonsensical nature of quantum phenomena. Despite the oft-heard statement that quantum particles do not follow well-defined paths in space-time, elementary-particle physicists have been utilizing just such a picture for fifty years. How is this reconciled with the quantum leap that seems to characterize atomic transitions and similar phenomena? We can see how, in the space-time diagram shown in Figure 2. Figure 2. Effective nonlocality. How an apparent instantaneous "quantum leap" can be made between two points in space. An electron-positron pair is created at C by a quantum fluctuation of the vacuum. The positron annihilates an electron at A, undoing the original vacuum fluctuation so that there is zero net-energy change. 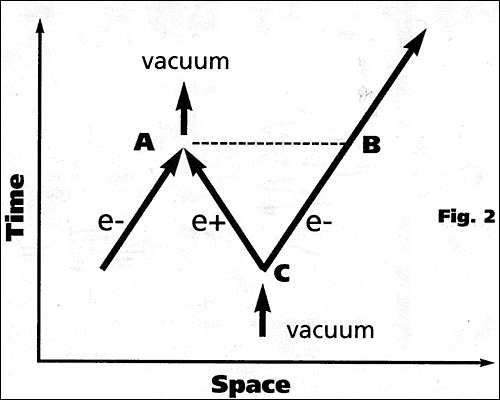 The electron thus appears to make an instantaneous quantum leap from A to B. The distance AB is comparable to the wavelength associated with the particle, so "holistic" wave behavior results. On the left, an electron (e-) is moving along a well-defined path. An electron-positron pair (e-e+) is produced at point C by a quantum fluctuation of the vacuum, allowed by the uncertainty principle. The positron annihilates the original electron at point A while the electron from the pair continues past point B. Since all electrons are indistinguishable, it appears as if the original electron has jumped instantaneously from A to B. In Figure 2, all the particles involved follow definite paths. None moves faster than the speed of light. Yet what is observed is operationally equivalent to an electron undergoing superluminal motion, disappearing at A and appearing simultaneously at a distant point B. No experiment can be performed in which the electron on the left can be distinguished from the one on the right. A simple calculation shows that the distance AB is of the order of the (de Broglie) wavelength of the particle. In this manner, the "holistic" wave nature of particles can be understood in a manner that requires no superluminal motion and certainly no intervention of human consciousness. Furthermore, since the quantum jump is random, no signal or other causal effect is superluminally transmitted. On the other hand, a deterministic theory based on subquantum forces or hidden variables is necessarily superluminal. Thus quantum mechanics, as conventionally practiced, describes quantum leaps without too drastic a quantum leap beyond common sense. Certainly no mystical assertions are justified by any observations concerning quantum processes. However, no compelling argument or evidence requires that quantum mechanics plays a central role in human consciousness or provides instantaneous, holistic connections across the universe. Modern physics, including quantum mechanics, remains completely materialistic and reductionistic while being consistent with all scientific observations. The apparent holistic, nonlocal behavior of quantum phenomena, as exemplified by a particle's appearing to be in two places at once, can be understood without discarding the commonsense notion of particles following definite paths in space and time or requiring that signals travel faster than the speed of light. No superluminal motion or signalling has ever been observed, in agreement with the limit set by the theory of relativity. Furthermore, interpretations of quantum effects need not so uproot classical physics, or common sense, as to render them inoperable on all scales-especially the macroscopic scale on which humans function. Newtonian physics, which successfully describes virtually all macroscopic phenomena, follows smoothly as the many-particle limit of quantum mechanics. And common sense continues to apply on the human scale. 1. 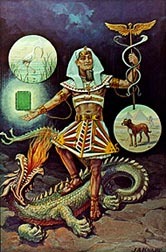 For a review of alternate medicine, including "quantum medicine," see Douglas Stalker and Clark Glymour, eds., Examining Holistic Medicine (Amherst, N.Y.: Prometheus Books, 1985). 2. For a fuller discussion and references, see Victor J. Stenger, Physics and Psychics: The Search for a World Beyond the Senses (Amherst, N.Y.: Prometheus Books, 1990). 3. L. A. Govinda, Foundations of Tibetan Mysticism (New York: Samuel Weiser, 1974), p. 225, as quoted in Capra 1975, p. 305. 4. See, for example, Marilyn Ferguson, The Aquarian Conspiracy: Personal and Social Transformation in the 1980s (Los Angeles: Tarcher, 1980). 5. Of course, in some cases those distributions may be highly peaked and thus an outcome can be predicted with high probability, that is, certainty for all practical purposes. In fact, this is precisely what happens in the case of systems of many particles, such as macroscopic objects. These systems then become describable by deterministic classical mechanics as the many-particle limit of quantum mechanics. 6. For a fuller discussion and references, see Victor J. Stenger, The Unconscious Quantum: Metaphysics in Modern Physics and Cosmology (Amherst, N.Y. : Prometheus Books, 1995). 1. Bohm D., and B. J. Hiley. 1993. The Undivided Universe: An Ontological Interpretation of Quantum Mechanics. London: Routledge. 2. Capra, Fritjof. 1975. The Tao of Physics. Boulder, Colorado: Shambhala. 3. Chopra, Deepak. 1989. Quantum Healing: Exploring the Frontiers of Mind/Body Medicine. New York: Bantam. 4. ---. 1993. Ageless Body, Timeless Mind: The Quantum Alternative to Growing Old. New York: Random House. 5. Eberhard, Phillippe H., and Ronald R. Ross. 1989. Quantum field theory cannot provide faster-than-light communication. Found. Phys. Lett. 2: 127-149. 6. Everett III, Hugh. 1957. "Relative state" formulation of quantum mechanics. Rev. Mod. Phys. 29: 454-462. 7. Goswami, Amit. 1993. The Self-Aware Universe: How Consciousness Creates the Material World. New York: G. P. Putnam's Sons. 8. Kafatos, Menas, and Robert Nadeau. 1990. The Conscious Universe: Part and Whole in Modern Physical Theory. New York: Springer-Verlag. 9. Squires, Euan. 1990. Conscious Mind in the Physical World. New York: Adam Hilger. 10. Wilber, Ken, ed. 1984. Quantum Questions: Mystical Writings of the World's Great Physicists. Boulder, Colorado: Shambhala. Victor J. Stenger is professor of physics and astronomy at the University of Hawaii and the author of Not By Design: The Origin of the Universe (Prometheus Books, 1988) and Physics and Psychics: The Search for a World Beyond the Senses (Prometheus Books, 1990). This paper is based on his latest book, The Unconscious Quantum: Metaphysics in Modern Physics and Cosmology (Prometheus Books, 1995).